A vehicle moves on Eucalyptus Street in Hesperia, Calif., after a winter storm covered the area on Dec. 6, 2018. Crews were busy Friday assessing damage and cleaning up after a storm that brought record rainfall to Los Angeles, snowfall to northern elevations, snarled traffic and forced evacuations as debris flows hit areas burned by wildfires. Evacuation orders were either lifted or downgraded Thursday night and Friday morning as the storm moved out of the area. That includes the area of Orange County’s Trabuco Creek, which overflowed with debris that took down a guardrail and overcame a narrow bridge. Workers need to clear out the debris from the bridge and install a new guardrail. Other crews were focused on Malibu, where a mudslide shut down the Pacific Coast Highway and surrounding roads in and around neighbourhoods charred by wildfire last month that destroyed more than 1,000 homes and killed three people. There were no reported injuries associated with the mudslide or debris flows and no homes were seriously damaged, though multiple people had to be rescued in Los Angeles, Orange, Riverside and San Diego counties as water overcame roadways and at times submerged cars. More than 300 people living in a San Diego shelter had to be evacuated to a stadium. The storm also caused several roof collapses and sent an airliner skidding off a runway in Burbank, though no associated injuries were reported. “It did cause a lot of headaches,” said Eric Boldt, a meteorologist with the National Weather Service. He said the storm was more typical of January or February for the region and called it a win for drought-weary Los Angeles. The downtown area set a rainfall record for the day with 1.9 inches (4.8 centimetres) of rain, nearly double the previous record set in 1997, the National Weather Service reported. Normal monthly rainfall for December is only a bit more – 2.33 inches (5.8 centimetres). 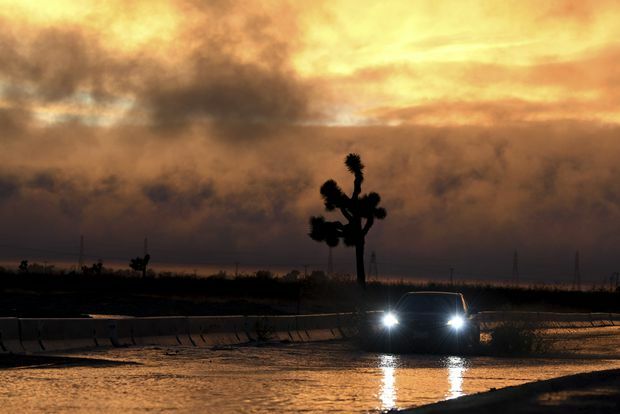 Rainfall also broke a record in the high-desert city of Lancaster, northeast of Los Angeles. That city saw 1.4 inches (3.5 centimetres) of rain, beating the previous record of 1.2 inches (3 centimetres) in 1997. Other total rainfalls exceeded 4.5 inches (11.4 centimetres) in some parts of Los Angeles County, including Avalon and the Pasadena foothills, and in San Diego County. Some residents took advantage of the rare rainy day, with at least one man captured on video surfing down the street as an SUV pulled him. Another paddle-boarded in a wetsuit near a flooded truck in Costa Mesa. While rain caused numerous accidents and backups on LA-area freeways, heavy snow forced the closure of Interstate 5 in the Grapevine area between Los Angeles and the San Joaquin Valley. The hours-long shutdown along the key north-south route caused backups for miles. Drivers were urged to use caution on mountain passes, where up to 10 feet (3 metres) of snow fell at higher elevations.